Financial institutions face mounting pressure to comply with a raft of global regulatory requirements aimed at improving transparency, oversight and control over trading and business operations, to reduce risk and improve the stability of the markets while enabling performance and ensuring investor protection. Xmetrics® enables users to track, monitor, store, analyse and alert on all transactions across all tiers, asset classes, geographies and technologies in real-time. We work with leading organisations in the Equities, FX, Fixed Income, Commodities, Energy and Derivatives markets. 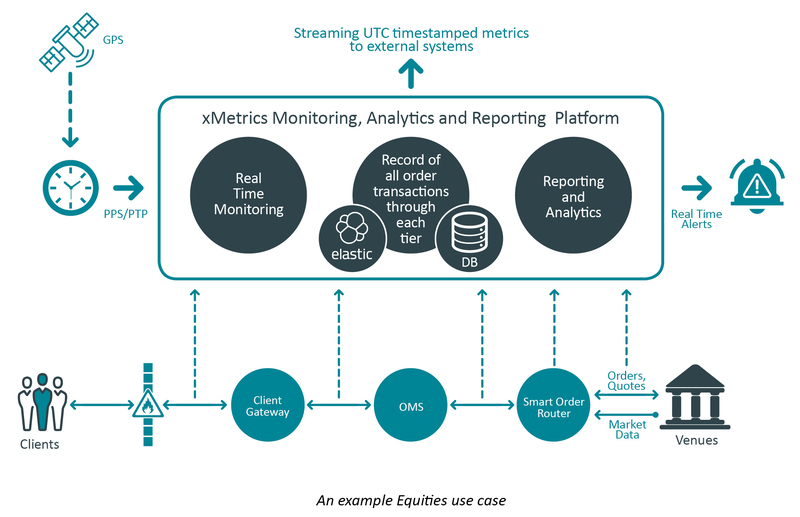 Xmetrics® provides complete visibility over the full transaction lifecycle - In order to fully understand the order and trade flow, firms need to go beyond simply understanding network performance and assess the real-time status of the execution and price consumption paths and the underlying data to detect anomalies and be able to hold their outsourced technology vendors accountable. We provide sell-side firms with independent performance monitoring, analytics, alerting and reporting tools across all trading, network and application infrastructure points involved in any transaction, which enable them to drive business and operational improvement, increase revenue and comply with their global regulatory requirements by unlocking the value of the underlying raw or derived data. Enabling visibility into the entire transaction lifecycle from market data to order, order acknowledgement to fill - “Tick To Trade” provides our users with critical insight, allows them to identify and mange problems quickly and is ideally placed to help demonstrate best performance or best execution to their clients whilst managing operational and regulatory risk. Event Replays to assist Backtesting for Improvement and Innovation - Xmetrics® delivers the ability to “replay” market events, helps enable compliance with algo stress testing regulations by facilitating backtesting, and provides valuable insights into possible performance improvements. Effectively managing market making environments is inherently difficult due to the need to accurately track the Market Data coming into the environment, the behaviour of the strategy/pricing engine, and the outgoing quotes. A deep and fully transparent understanding of the performance of the environment is critical in order to reduce arbitrage opportunities, meet obligations and increase profitability. To understand the performance of the platform complex mapping is required to correlate underlying ticks to, for example, Warrant prices and accurately model the behaviour of the environment, however complex. Xmetrics® can do all this, in real-time, even in fast markets, whilst providing the data needed to hone trading strategies, adapt to evolving market structure and drive P&L. For consumers of market data it is critical to continuously assess the quality and performance of feeds and understand the characteristics of every single tick that is driving trading decisions. Whether an algorithmic, market making or FX price creation environment not understanding market data anomalies in real time and being able to rapidly react can be extremely costly if built on compromised data. Xmetrics® not only provides users the ability to monitor for gaps in multicast data feeds but also having fully decoded all the business objects inside each tick alert on trends and anomalies including rate, volume, price movement, whether an instrument is ticking slower than its historical norm, whether ticking on bid but not offer, or whether there is inconsistency between A and B feeds, individual markets or feed handlers. Xmetrics® can track and alert in real-time on the flow of data across every hop and provide performance metrics on both raw and normalised market data feeds being consumed by any trading environment. As all data is persisted users can easily be alerted to not only the raw gaps, microbursts, message rates and trends from metadata, but also carry out in depth analysis built on derived metrics created specifically for their business. In order to continue to attract liquidity, new and existing trading venues must be obsessive and transparent about latency and performance measurement across key tiers of their infrastructure and deliver high performance, high quality price feeds, with the ability to identify and deal with any issues quickly and effectively. This is coupled with ever increasing regulatory oversight such as the MiFID II requirement for venues to publish data on the quality of execution of transactions, real time monitoring and alerting, capacity and conformance testing. It is not enough just to measure the latency from the client gateway; participants crave information regarding the performance of all tiers. In addition, support teams require complete visibility in order to be able to deal with member issues quickly and effectively. Xmetrics® provides liquidity venues with Real-time monitoring of matching engines and price publishers including in-process instrumentation (IPI) allowing for the provision of secure, logically separated views for each participant and allowing for performance transparency. The ability to identify problems in advance of them being seen by participants and quickly identify which have been affected, allowing for rapid problem resolution and independent verification of performance and conformance to SLAs. Financial institutions face mounting pressure to comply with a raft of global regulatory requirements aimed at improving transparency, oversight and control over trading and business operations, to reduce risk and improve the stability of the markets. Transparency is required across transaction monitoring and performance, with firms needing to accurately timestamp and make information available to regulators, either continuously for transaction reports or in response to unplanned ‘spot checks’. The new requirements dictate that trading information will need to be stored and be made immediately accessible for five years and accountability cannot be outsourced. At the heart of these requirements is a need for clean, verified, easily accessible, current and historical (five years) trading data. Given the asset class multiplying effect, monitoring, tracking, alerting and reporting non-linear transaction data in real time is a huge challenge for firms using highly distributed platforms, this, coupled with often-siloed technology teams and processes further increases the level of difficulty. The Xmetrics® platform provides a fully independent and integrated solution for the capture of all application network and transaction data required for ESMA RTS reporting, evaluation and storage which can be easily deployed without the need to overhaul existing IT infrastructure. Application service providers offering trading and market data applications across all asset classes are coming under increasing pressure to improve customer confidence in their services. They have begun to face calls to provide real-time performance monitoring and reporting tailored to each individual customer, which has proven to be complex, costly and time consuming. Xmetrics® is ideally placed to assist Application Service Providers and Independent Software Vendors (ISVs) with a compelling combination of both application performance and network/flow monitoring which can deliver real-time alerting on SLA breaches and provide individual clients a holistic view of both functional and network tiers at the same time in a single solution. This is delivered by instrumentation of the application itself, implemented alongside on-the-wire monitoring to provide total end to end visibility, which can be used for forensic analysis internally, and provided to clients for their own analysis with the provision of secure, logically separated views for each unique customer. Clients and users of extranet service providers are beginning to expect more than simply enhanced network performance monitoring. Increasingly they demand more sophisticated levels of transaction monitoring and metrics, to better understand how trading traffic is transported and whether for example there is any impact on performance during times of high trading volumes or during volatile sessions. To date, many extranet services providers have found adequate monitoring solutions both prohibitively expensive, and difficult to deploy and support. Extranet service providers allocate bandwidth based on client demand but need to understand the traffic profiles of their clients in order to allocate bandwidth correctly based on actual usage. Increasingly clients also demand metrics from both a flow and application perspective, not just the network. Currently these needs are difficult to meet and problem diagnosis and resolution can be a lengthy process. Understanding the performance of clients execution and market data across the infrastructure and proving that there are no issues within the network is impossible without clear evidence. Also, in this highly competitive area it is no longer enough to provide connectivity - it is important to continually offer new value-added services in order to differentiate and win new business. Xmetrics® delivers a compelling combination of both Network and Flow monitoring which allows both Infrastructure providers and their customers to monitor execution performance and market data consumption in real time including metrics such as capacity utilization, bandwidth, microbursts, packet loss and TCP and UDP behaviour and events. Xmetrics® provides secure, logically separated views for each client and the ability to monitor and alert in real-time on SLA breaches and effectively manage troubleshooting. We have extensive experience of evaluating, developing and deploying solutions for large multi asset class secondary trading environments. Our balanced perspective, unmatched financial industry expertise and desire and ability to embrace new and emerging technologies uniquely enables us to advise clients on data analytics solutions to optimise trading infrastructure effectiveness. Investment firms and venues now have multiple choices regarding how they implement fast analytics solutions. We work with clients to devise optimal solutions for fast analytics stacks, combining real-time data processing, historic time-series storage and querying, and analysis across visual and predictive analysis to drive improved execution performance. We also work with clients to provide latency determination, platform engineering and development services.